Knowing how to swear in Spanish is a worthwhile skill. It has paid off far more than most of the junk (like Algebra II) that I was learning in school at the time. Don't order sausage rolls. One of my first jobs at Italian Delight was tearing the sausage strips out of old rolls and putting it into new rolls. Seriously. It quickly occurred to me that the sausage could, conceivably, be reused indefinitely. I permanently stopped eating sausage rolls. Bleach cleans anything. It will even clean skin, although the skin will then tend to fall off. The third thing ended up being the most useful, as many of my subsequent jobs in the food service industry involved cleaning of one sort or another. In fact, looking back, the most important thing that I learned at Italian Delight was the vital importance of obsessive cleanliness, a lesson that was drilled in at Jerry's Subs and Pizza, McDonald's, and Bollo's Bakery and Cafe. Unfortunately, however, my experience seems to be somewhat atypical. While my bosses were borderline paranoid about killing germs, cleaning floors, scrubbing surfaces, and ridding the world of grease, many restaurants don't seem to have the same scruples. In fact, a recent article noted that, on average, restaurants in Tennessee received an 82 out of 100 points on their health inspections. Only a third of all restaurants scored 90 or higher. 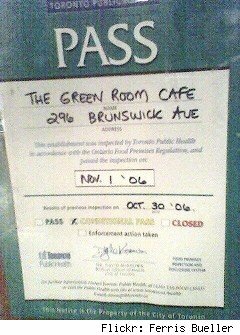 Worse yet, these restaurants are only inspected twice a year; granted, these are unannounced, random tests, but it would still be nice if they happened more often! When I was in South Carolina, I discovered something wonderful. South Carolina's eateries are required to prominently post their inspection grades outside the restaurant. The placards list the grades as A, B, or C (in this case, D is a failing grade!). Patrons, in turn, can make an educated choice about the restaurant that they are visiting, and may determine if a cinnamon bun is truly worth getting their stomachs pumped. On a recent trip to San Diego, I noticed that several restaurants also posted letter grades, which led me to wonder if California uses a similar system (the state public health website was unclear about this). Amid all the talk about reducing trans-fats and improving nutrition, perhaps we should take some time to consider the hygiene of our restaurants. Although there doesn't seem to be a huge public outcry about e-coli and giardia, these foodborne organisms can be an expensive, and even deadly, addition to a restaurant tab! Bruce Watson is a freelance writer, blogger, and all-around cheapskate. Whenever he eats out, he packs a blowtorch and a 20% solution of bleach and water. Between them, he's pretty sure that he can kill all the bacteria on his food.